President Trump says he wants to roll back the burden of regulation. Give the morass of red tape that is strangling the economy, this is a very worthy goal. It’s also a daunting task. 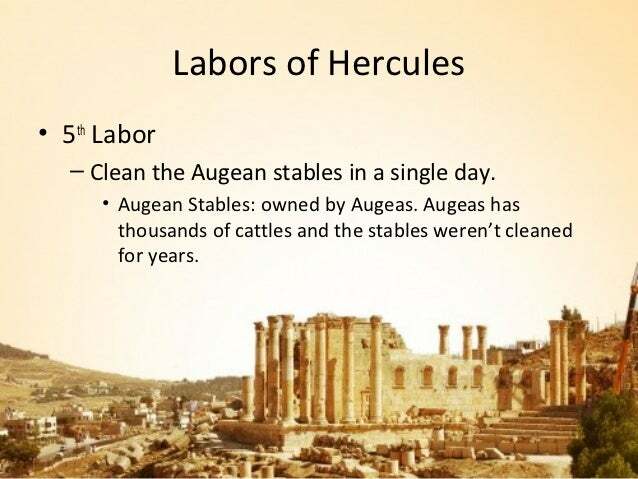 Fixing the sprawling regulatory state is the modern version of cleaning the Augean stables and I’m not brimming with confidence that Trump and his appointees have Herculean powers. That being said, if they’re deciding where to focus their deregulatory efforts, cost-benefit analysis would be a very useful guide. Simply stated, go after the red tape that imposes the highest costs while yielding the fewest benefits. And if that’s the approach, so-called anti-money laundering regulations should be on the chopping block. Banks and other financial institutions are now being forced to squander billions of dollars in order to comply with laws, rules, and red tape that require them to spy on all their customers. The ostensible purpose of AML policies is to discourage criminal behavior, but experts have concluded that this approach has been a failure. To the extent that AML policies have had an impact, it’s been negative. In addition to high costs and inefficiency, the laws and regulations have disproportionately harmed poor people. Richard Rahn, in a column for the Washington Times, says AML laws are the modern version of prohibition, well-meaning in theory but counter-productive in practice. Money laundering fits under the definition of vague law because, unlike murder or robbery, it is not a crime of an act but one of “intent.” …This leads to many problems and substantial prosecutorial abuse. It is not only banks and financial institutions that are supposed to know the source of their clients’ funds, but also such diverse people as car dealers, pawnbrokers, real estate agents, and on and on. Often, it is not considered good enough to know the source of a customer’s funds (often a near-impossibility), but the source of the funds of the customer’s customer. …The result is that banks and other financial institutions increasingly refuse to open accounts for low-income people… There is a very high fixed cost for banks and others to do “due diligence” on their customers — the costs being roughly the same for a $5,000 deposit, a $500,000 deposit or a $5,000,000 deposit. Given the massive penalties banks and other financial institutions are subject to for making even an unintentional mistake, their safest course of action is to drop small customers. …Recent academic and think tank studies show the situation only getting worse — all cost and no gain. …the poor, including poor countries, and the honest pay a huge price for all of the additional compliance costs, which reduces productive global capital formation and real incomes. And the price isn’t trivial for the nations that get targeted, as I pointed out in testimony to the Organization for American States. A working paper from the Center for Global Development digs into the numbers. 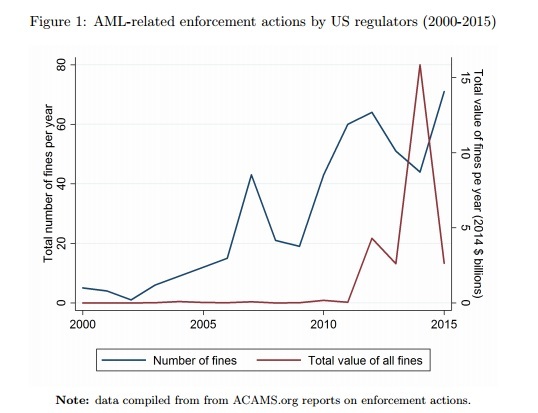 The past fifteen years have seen an unprecedented level of attention on anti-money laundering…issues by financial regulators…the total value of fines levied by regulators peaked at $15 billion in 2014 in the US alone. …Between 2010 and 2015, the Financial Action Task Force (FATF), an international group tasked with setting common AML standards across the globe, added over fifty different countries to an internationally-recognized list of high risk countries. …there are growing concerns that this increase in regulatory activity is leading to a chilling effect on cross-border economic activity as banks limit their exposure to high risk clients or jurisdictions, a process known as ‘de-risking’… This contraction of the correspondent banking network has sounded a number of alarm bells, as these services are seen as being crucial for most cross-border services… The ICC survey reported that over 40% of respondents felt that AML and know-your-customer (KYC) requirements were a significant impediment to trade finance, with nearly 70% reporting they declined transactions that year…a large number of money transfer companies in the US, the UK and Australia have lost access to banking services as a result of banks’ desire to reduce their exposure to regulatory risk, potentially leading to a reduction to a decrease in formal remittances to developing countries, a critical source of development finance… The combined effect of all of these pressures should be leading to declines in the aggregate flow of cross-border payments. And here are the results of the new empirical research in the study. The combination of large scale fines, higher compliance costs and international naming-and-shaming has – anecdotally – led many banks to withdraw from certain lines of business or geographic areas, to the potential detriment of cross-border economic activity. …We find evidence that greylisting by the FATF is consistent with up to a 10% reduction in the number of payments received by an affected country. …Issues of economic impact aside, these results suggest there is more work to be done on assessing both the effectiveness and the efficiency of the global AML/CFT regulatory regime. …First, the reduction in payments received by countries subject to greater regulatory scrutiny raises the spectre of potential losses to these countries. 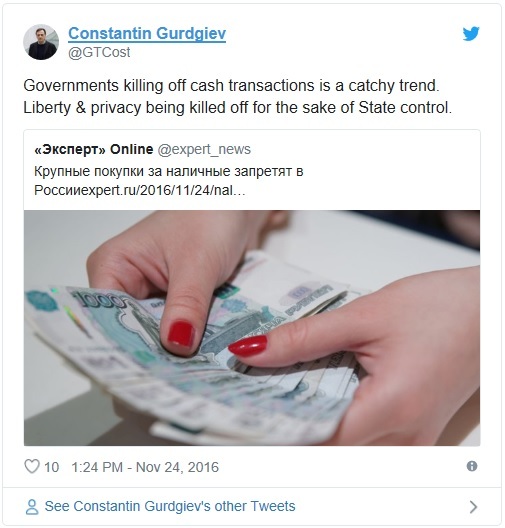 Second, that there is either no effect or a positive effect of FATF greylisting on the number of payments leaving a designated country suggests that increased scrutiny may not do much to prevent illicit money from leaving high risk countries and entering the international financial system at large. In other words, lots of costs, mostly borne by poor people and poor nations, but no evidence that criminals and terrorists are being stopped. Rather than imposing lots of red tape and requiring banks to spy on everybody, it would be much better if the government followed normal rules in the fight against crime. By all means, it should investigate real crimes, collect evidence and build cases (within proper limits), and work to punish those who inflict harm on others. But don’t squander resources in ways that aren’t effective. Some have suggested that it would make sense to have banks monitor a discrete list of potential bad guys rather than promiscuously spy on all customers. That might be a step in the right direction, but this story from the UK-based Times shows that this approach leaves something to be desired. A controversial “blacklist” used by British banks to identify terrorists and potential money launderers has grown so bloated that it includes details of a three-year-old member of the royal family… World-Check, a database of more than two million “high-risk” individuals including criminals and senior politicians, is used by 49 of the world’s 50 biggest banks to carry out compliance checks on existing and potential clients. Customers who are flagged up face extra scrutiny and their accounts…hundreds of individuals were included partly on the basis of unverified blog posts and even far-right or extremist websites. Wow. Since some of my leftist friends consider International Liberty a “far-right” and “extremist” website, this doesn’t bode well for me. I guess I’m lucky that I still have a bank account. Here’s more from the story. These absurd results are driven by government policies that force financial institutions to treat all customers as potential crooks. And given the huge fines that are being levied on banks and other firms, you can understand why they drop customers and charge high fees. They are forced to act defensively. And some of those “false positives” are mentioned in this video I narrated for the Center for Freedom and Prosperity. P.S. Statists frequently demagogue against so-called tax havens for supposedly being hotbeds of dirty money, but take a look at this map put together a few years ago by the Institute of Governance and you’ll find only one supposed haven among the 28 nations listed. P.P.S. You probably didn’t realize you could make a joke involving money laundering, but here’s one featuring former President Obama. P.P.P.S. But when you look at the real-world horror stories that result from these laws, you realize that the current system on money laundering is no laughing matter. P.P.P.P.S. And you won’t be surprised to learn that the statists have learned the wrong lesson. They see that AML laws have been a failure and think the right response is to go nuclear and ban cash entirely. The War against Cash is a battle that shouldn’t even exist. But politicians don’t like cash because it’s hard to control something that people can freely trade back and forth. So folks on the left are arguing that governments should ban or restrict paper money. In Part IV, a few months ago, there was additional discussion of the dangers that would be unleashed if politicians banned cash. Now let’s add a fifth installment in this series, and we’ll focus on the destructive turmoil resulting from India’s decision earlier this month to ban “large” notes. The Financial Times explains what happened. India unexpectedly scrapped all larger-denomination banknotes overnight… Prime Minister Narendra Modi said 500 and 1,000 rupee notes — worth around $7.50 and $15, respectively — would cease to be legal tender from midnight on Tuesday. The announcement stunned Indians, who were given four hours’ notice that much of their cash would be “mere paper”. RBI data suggests that the Rs500 and Rs1,000 notes account for 86 per cent of the value of all cash in circulation in India at present. …The shock move is the latest step by Mr Modi’s administration to crack down on the vast shadow economy, which remains beyond the reach of India’s tax authorities. Before delving into why this is an unfortunate development, I can’t resist pointing out that banknotes worth $7.50 and $15 are neither large nor inappropriate for an economy at India’s level of development. When the United States had a similar level of per-capita GDP (back in the late 1800s), there were $500 and $1000 notes. Yet America didn’t have serious problems with corruption and tax evasion. So why should the existence of far smaller bills be a problem in India today? I’ll return to that question in the conclusion, but let’s first look at the impact of Prime Minister Modi’s unilateral attack on currency. A column in the New York Times explains why the policy does more harm than good. On Nov. 8, the Indian government announced an immediate ban on two major bills that account for the vast majority of all currency in circulation. …In the two weeks after the measure was announced, millions of Indians stricken with small panic rushed out to banks; A.T.M.s and tellers soon ran dry. Some 98 percent of all transactions in India, measured by volume, are conducted in cash. …So far its effects have been disastrous for the middle- and lower-middle classes, as well as the poor. And the worst may be yet to come. The ripple effect of the policy is large and unpleasant. …demonetization is a ham-fisted move that will put only a temporary dent in corruption, if even that, and is likely to rock the entire economy. …Anyone seeking to convert more than 250,000 rupees (about $3,650) must explain why they hold so much cash, or failing that, must pay a penalty. The requirement has already spawned a new black market to service people wishing to offload: Large amounts of illicit cash are broken into smaller blocks and deposited by teams of illegal couriers. Demonetization is mostly hurting people who aren’t its intended targets. Because sellers of certain durables, such as jewelry and property, often insist on cash payments, many individuals who have no illegal money build up cash reserves over time. Relatively poor women stash away cash beyond their husbands’ reach. 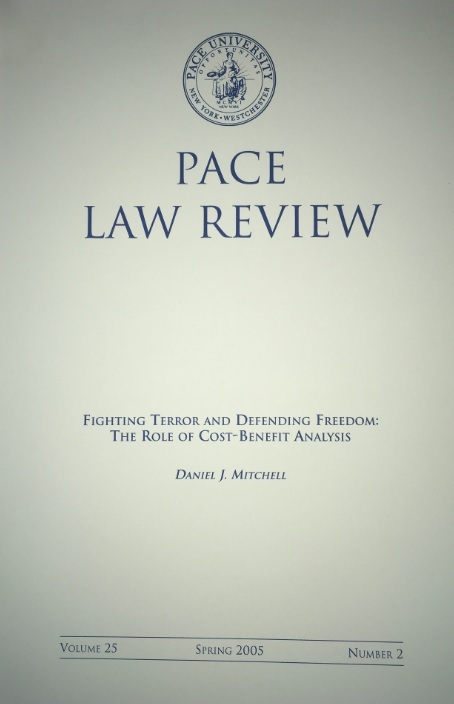 As is so often the case, the bogeyman of terrorism is being used as a rationale for bad policy, even though everyone realizes that terrorists won’t be affected. When the government announced demonetization, it also justified the measure as a way to curb terrorism financing that relies on counterfeit rupee notes… Catching fake notes already in circulation neither helps trap the terrorists who minted them nor prevents more such money from being injected into the economy. It simply inconveniences the people who use it as legal tender, the vast majority of whom had no hand in its creation. I’m sympathetic, by the way, to the notion that the government should fight counterfeiting. Crooks printing up fake notes is even worse than central banks printing up too many real notes. In any event, this indirect attack on the shadow economy imposes considerable costs on regular Indians. In a country like India, where the illegal economy is so intimately intertwined with the mainstream economy, one inept government intervention against shadow activities can do a lot of harm to the vast majority, who are just trying to make a legitimate living. Writing for Bloomberg, Elaine Ou has a negative assessment of this proposal. India is conducting a big test of the idea that getting rid of cash can help address crime and corruption. Unfortunately, it might achieve nothing more than a lot of inconvenience. Criminals and corrupt officials often conduct business in cash, because it’s hard to trace. So in a sense it’s logical to assume that abolishing cash will help reduce criminal activity. …This rationale has led Indian Prime Minister Narendra Modi to declare a surprise cancellation of the nation’s two highest-denomination notes, effectively invalidating 86 percent of total currency in circulation. Anyone with outstanding notes must either deposit them in a bank — potentially incurring a tax — or exchange them for replacements in strictly limited sums. Ms. Ou explains that the policy will be traumatic for the hundreds of millions of Indians who don’t have bank accounts. In a country where most transactions are conducted in cash, many people have been unable to pay for necessities like food or medical services. Banks have had to work overtime to handle the exchange, bringing other financial services to a halt. It’s certainly likely that the sheer trauma will leave people less keen to hoard rupees, creating a big incentive to move economic activity out of cash and into banks. Except that a huge number of Indians don’t have a bank account. In any event, she points out, banning cash won’t have much impact on corruption since politicians and public officials have plenty of ways to extort wealth from the productive sector. …the prevalence of cash is far from a foolproof indicator of criminality and corruption. Consider Nigeria, which is perceived as one the world’s most corrupt countries and has a currency-to-GDP ratio even lower than Sweden’s… Nigerians have abandoned cash because they have so little trust in government-issued currency. Instead of using banks, they tend to transact in mobile airtime minutes. …Those with more substantial wealth put it in foreign currency. By undermining faith in its cash notes, India may go the way of Nigeria. Villagers are already resorting to barter. …corrupt public officials were believed to have their wealth in real estate and gold. A news report highlights the real-world impact of the Indian government’s bad policy. Starting with the impact on a poor single mother. With demonetisation, Sayyed’s family has been forced to cut costs across the board to make sure their limited cash resources don’t get exhausted faster than the banks can exchange money. “Last week it took me four hours of waiting in line to get my old notes exchanged,” said Sayyed. “And because no one had change for a Rs 2,000 note, I had to buy ration on credit for six whole days.” Vegetables and foodgrains, says Sayyed, have grown more expensive in the past 10 days, because of the impact of demonetisation on wholesalers and retailers. And the impact on a small-business owner. His salon, which charges Rs 40 for a haircut, used to make anywhere between Rs 1,000 to Rs 1,200 on the weekend. But now, he said, that has fallen to Rs 500. …How is he coping with this liquidity crunch? 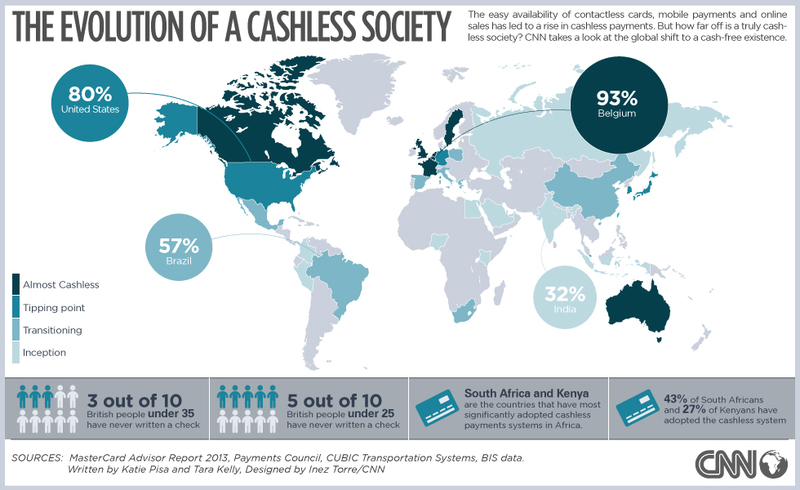 Not by going cashless. In part because he doesn’t have a bank account. “I tried to open one but they wanted too many proofs of identity,” Sharma said. By the way, Sharma is a victim of pointless anti-money laundering laws, something even the World Bank recognizes as being particularly harmful for the poor. A farmer also has been hit hard. It has been three weeks since Vedagiri’s single acre of land had been tilled and paddy seedlings had been sown. …“The cooperative bank cannot lend us money now, so for the whole of last week, our crop has been standing without pesticides,” said Vedagiri. Several times last week, Vedagiri and the other farmers of Royalpattu were turned away by bank employees. New currency notes have been slow to reach most rural cooperative banks across India. While sowing the crop, Vedagiri had employed 20 labourers. But he has been unable to pay any of them since he had not still received the rest of the money…Vedagiri does not know how he will get through this cropping season without incurring a loss. Bloomberg reports on some of the bizarre unintended consequences of this bad policy. Indian ingenuity is being stretched by Prime Minister Narendra Modi’s cash ban to crackdown on unaccounted money. India’s cash economy has been thrown into turmoil since Modi announced last week that 500 and 1,000 rupee notes would cease to be legal tender and would have to be deposited at banks by year-end, leaving about one-seventh of currency in circulation. …Here are some unintended consequences. Indian defense jets are on standby to airlift cash from mints across India to remote corners of the country. …wealthy Indians rushed to make costly purchases with unaccounted cash. One luxury watch outlet in north-west Mumbai saw 45 units of Rolex watches sold on a single day, according to a representative of a watchmaker, who was present when the sales took place. Demand matched what the shop would usually sell in a month and the store had to turn away customers… A new gold rush also emerged soon after Modi’s announcement. “Jewelers who had shut shop for the day on Nov. 8 had to reopen their stores within a couple of hours and were selling gold up to 4 a.m.,” Chirag Thakkar, a director at gold wholesaler Amrapali Group, said by phone… Customers paid as much as 52,000 rupees per 10 grams, almost double the current prices, he said. …About half of an estimated 9.3 million trucks under the All India Motor Transport Congress were off the road eight days after the announcement as drivers abandoned vehicles mid-way into their trips after running out of cash, according to Naveen Gupta, secretary general of the group. India’s roads carry about 65 percent of the country’s freight. Drivers don’t have enough money for food, truck maintenance and to make payments at border check posts. …Compounding the problem of pumping new money into the system is the need to reconfigure the country’s 220,000 cash machines so that they can dispense the new 500 and 2,000 rupee notes, which do not fit into existing ATM cash trays. To be fair, some of these costs are transitory in nature, so it’s important to distinguish between those consequences and others that might linger. Though the part of this story that doesn’t make sense is that the government plans on issuing new high-value banknotes. So the Prime Minister is not actually banning large banknotes (or even all non-digital currency), which is the usual goal of the war-on-cash crowd. So why did the Modi cause so much turmoil with an overnight ban rather than allow for an orderly transition? I’m assuming that the answer has something to do with inconveniencing those with large cash holdings, some of whom will be crooks or counterfeiters or corrupt public officials. As already noted, the battle against counterfeit currency surely is worthwhile. But I have considerable doubts about whether this currency swap will have much impact on the shadow economy or public corruption. And that brings me back to the rhetorical question I posed early in this column about why the United States didn’t have massive problems with crime and public corruption back in the late 1800s (when our per-capita GDP was akin to India’s today according to the Maddison data), even though we had banknotes that were far more valuable ($500 and $1000 compared to $7.50 and $15). The answer, at least in part, is that the United States had a very tiny government. 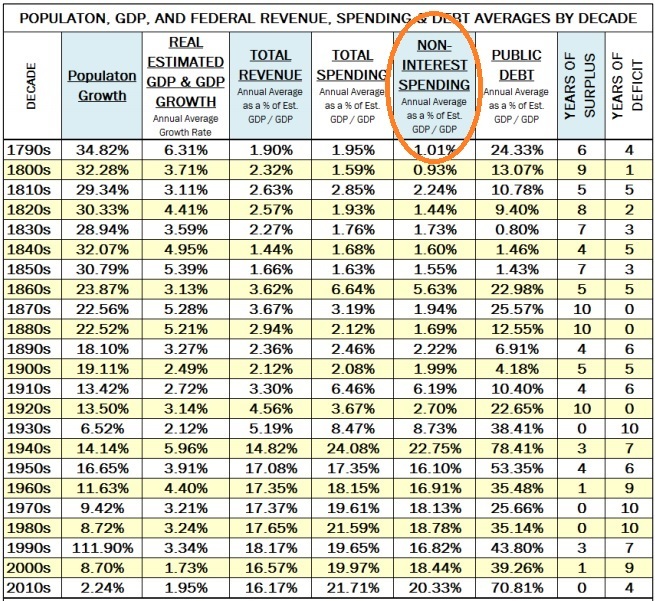 Government spending consumed at most 10 percent of economic output, with most of that spending at the state and local level. And there was no income tax. And since people weren’t penalized for earning money and creating wealth, there was no incentive to be part of the shadow economy. And since government was small, there weren’t that many favors to distribute, so there wasn’t much need to bribe politicians or bureaucrats. If Prime Minister Modi wants a vibrant, above-ground economy with minimal corruption, maybe that’s the path he should follow. Let’s close with a very sage warning from Richard Fernandez’s column in PJ Media. And my favorite Russian-Irish-Californian economist also has a very apt summary of this issue. Remember, if the answer is more government, you’ve asked a very silly question. P.S. If he wants more future prosperity, Modi also should make sure the government no longer attacks private schools. P.P.S. And it also would be a good idea to reform civil service rules so that it doesn’t take two decades to get rid of no-show bureaucrats.